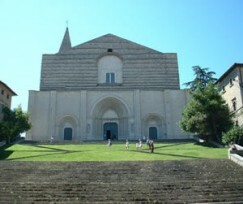 In the center of Todi, at the top of steep stairs, you would find the temple of St. Fortunato (Bishop of Todi), erected on the XV century in gothic style. The ouside facade, not finished, is remarkable also for the Marble Door. Inside Jacopone da Todi is buried. The interioir is divided three corridors with the center one ending with the statue of the saint. On the two lateral, small chapels and frescos are present. In the lower level it is possible to visit the tumb of St. Fortunato and the grave of Jacopone. From the top of the curch bell tower it is possible to admire a beautiful view of the umbrian landscape.